CEPRI is governed by a Board of Directors, whose number of members is determined by the general assembly and ranges from a minimum of 6 to a maximum of 15. The members of the Board of Directors are elected by a secret ballot by the general assembly for a 3-year term. Every year, a third of the board is up for re-election and there are no term limits. 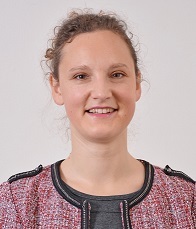 After earning her bachelor’s degree in Public Law, Stéphanie Bidault completed a doctoral dissertation on “Area Management and Major Risk Prevention.” For a number of years, she was the head of the Public Law curriculum (natural disaster law in particular) at the Clermont-Ferrand School of Law and Political Science. She was also responsible at this time for training various teams. Since she came to CEPRI in February 2007, she has helped it become what it is today. She currently leads CEPRI as its managing director. Valérie Griffon, who holds a degree in administrative assistance, joined CEPRI in November 2010. She is an essential intermediary, taking charge of making sure the organization runs smoothly and that are projects are carried out professionally and efficiently. She is extremely helpful in her role as a participant in the general committee that oversees the life of the organization, in managing the organization’s budget, and in forging deals with our various partners. Finally, she assists in running our external communication initiatives. Graduate of Political Studies in Strasbourg Institute, she holds a Master's degree in Environmental and Risk Law. She has been working at CEPRI since April 2008. She leads projects dedicated to flood risks integration into land planning and land use decisions, she monitors and addresses specific issues related to the implementation of the GEMAPI competency. 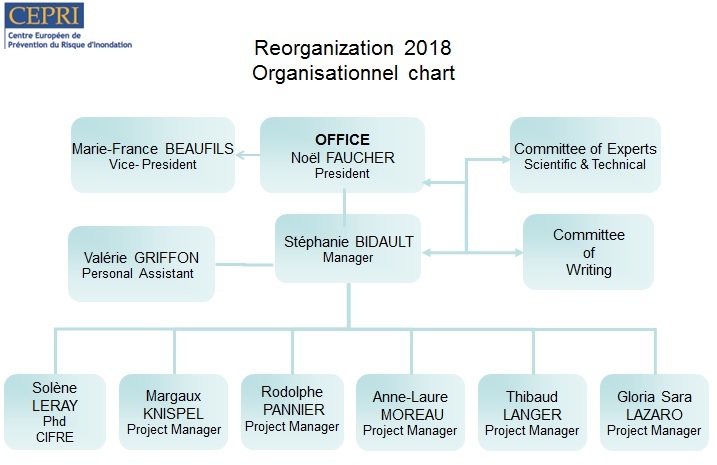 She co-leads the National Network of Action Planners for Flood Prevention (PAPI “Programmes d’Actions de Prévention des Inondations”) and the Local Flood Risk Management Strategies (SLGRI). Holder of a Master 2 in "Natural Risk Management" and Master in "Land use management" and a Master in Political Science, joined the CEPRI team in March 2009, after six years in various local authorities. Through the links he has forged with the actors in the field, he has a solid expertise of initiatives that are carried out locally as well as the best and reproducible practices in terms of flood prevention. In particular, he works on flood forecasting, warning and crisis management issues. He co-leads the PAPI / SLGRI network. Who holds a double degree in public works and urban planning (2cole special school of public works and Master "Territorial and Urban Strategies" (risk course) of Political Sciences, will occupy a Project Manager position on the Vulnerability reduction with specialization on runoff risk. In charge of studies on natural hazards and geomatics, holds a geosciences master's degree in "Earth dynamics and natural risks" and a geomatic master's degree SIGMA "Georeferenced Information Science for the control of the environment and development territories ". He has just completed a position as Project Manager on Vulnerability Reduction with specialization on Analyze Cost-Benefit (ACB) / Analyze Multi-criteria (AMC) methods. A Spanish national (trilingual, English and French) with a Master's degree in "European Project Management and Training in Environmental Sciences", will assume the position of Project Manager to ensure the European development of the structure. Combines a dual curriculum combining landscape and anthropology. Graduated from the National School of Landscape of Versailles in 2008, sensitive to the landscapes subject to the risks of water, she devotes herself today, after a post Master from the National School of Architecture of Paris La Villette, to the writing of a dissertation (Paris Nanterre University, ED 395 Media, Cultures and Societies of the Past and the Present) on the perceptions of flooding and the risks representations resulting in the construction of the Paris metropolis. This research work is carried out in collaboration with the CEPRI through a CIFRE device over a period of 3 years from January 2018. CEPRI is a French national association of local authorities created in December 2006 to promote a new approach to flood risk prevention. Its functioning is ensured by a multidisciplinary team and thanks to the contributions of a committee of experts with multiple profiles (lawyer, geographer, economist, architect, urban planner, forecaster, hydraulician, psycho-sociologist ...).